"Country roads / take me home / to the place / I belong…"
The day started at a country road, and it ended fittingly with Niklas Hjalmarsson singing John Denver's "Country Roads." But in the young Swede's case, those roads were not West Virginia, but the heart of Smaland -- "small lands" -- in the heart of Sweden. Happy places and happy emotions. "But now I truly understand that it's true. And this Cup fest here is unbelievable. Everybody in the village has worked for it, voluntarily, without wanting anything back, just out of the goodness of their hearts," Sivert said. Niklas's mother, Eva, missed the Stanley Cup Playoffs when she suffered a stroke in late April -- but today, back on her feet, she was all smiles, watching Niklas, his elder brother Henrik, little sister Ida, and Niklas's girlfriend Elina have fun in the sun. 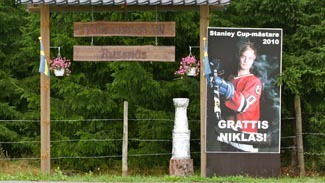 "It's wonderful to see how the whole village has come together behind Niklas. We haven't done this, everybody else has," she said. And Niklas seemed to enjoy giving back, showing off the Cup. "He's so modest and down to earth," Eva Hjalmarsson said, smiling, like only a proud mother can. The country road was full of cars, and like in "Field of Dreams" they came from nowhere, turned towards Russnas, in one big line, all with the same destination in mind. That Russnas road is where Niklas's roots are, buried deep underneath. Niklas Hjalmarsson's hometown spent Monday getting ready for a visit from the Stanley Cup that he helped the Chicago Blackhawks win in June. "Niklas was born here. I was born in that house over there," said Sivert, pointing to a beige house some 200 yards away, next to the playground where Niklas used to play, and where he was determined to bring the Cup. "And my sister lives there, and my mother over there, and there are a couple of Hjalmarssons across the street," he added. The garage door is filled with puck marks, left by shots that Niklas has fired from the driveway. It's looked like that for a while now -- and probably will look like that for a good while longer. "I think dad has changed his mind about getting a new door," Niklas said. "I respect my father immensely, there's nothing I wouldn't do for him," he added. No wonder then, that when Hjalmarsson had thought out loud what he could do with the Cup in the morning -- before the public Cup fest would begin -- and his father suggested taking it to the lunch cafeteria at his job, it was a done deal. "My father used to be a farmer for a long time but when we sold it, he took a job at the sawmill," Hjalmarsson said. Niklas carried the Cup into the cafeteria, and lifted it above his head, almost touching the ceiling. At the same time dozens of mobile phone cameras were lifted as well. "Does anyone want to lift it?" he asked. "Come on, here's your chance." Just one man came up and hoisted the Cup. "Anybody else?" Niklas said. "Come on you, old classmate of mine," he then shouted to a young man in the back of the room. And then it was time to get to the old playground with the swings, and the long jump place and open space where Niklas used to play soccer, but which today had hot dog stands, a shooting competition, a miniature golf course -- and axe throwing. It was probably also the first time "Chelsea Dagger" has been blasted off speakers at the playground. "It's amazing to see everybody's pure happiness for me, there's no jealousy, they really mean it when they say they're happy for me." "It's amazing to see everybody's pure happiness for me, there's no jealousy, they really mean it when they say they're happy for me," Hjalmarsson said. "Take a lot of photos, people, who knows when this thing will be back again," he said. Next stop: Eksjo hockey rink, where it all began. Dozens of kids, dressed in Eksjo's blue sweaters, had come to see their hero, and to join him in a parade through the city. A marching band from Poland -- in Eksjo to participate in Eksjo Tattoo -- led the way as Hjalmarsson and the Cup made their way to the Stortorget, the main square of Eksjo. What started out as a small parade grew with every block, so that the sidewalks were full of people when the truck got into the square. 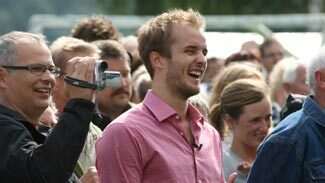 But when Hjalmarsson saw the hundreds of people waiting for him in the stands, his jaw dropped. He was celebrated, interviewed, and sung to. He got the minutes of the town council meeting from the morning where they promised to arrange ice for Niklas Hjalmarsson Hockey School in 2011. A Niklas Hjalmarsson Hockey Stipend will be founded. And when the new head coach of Team Sweden, Par Marts, asked him what he would say to an invitation to the World Championships (provided he's healthy and not in the middle of another Stanley Cup run), Hjalmarsson said, "ja, tack" -- yes, thank you -- evoking big cheers from the crowd. Today, nothing was impossible for Hjalmarsson. He even helped the Keepers of the Cup, Phil Pritchard and Walter Neubrand, settle a bet they had made earlier in the morning, about whether the country boy, whose relatives milked their cows before going back to bed after the Stanley Cup Final games, knows how to milk a cow.